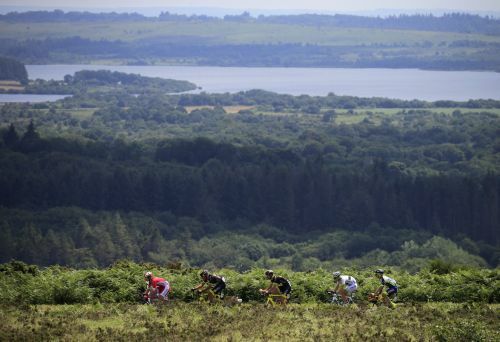 MUR -DE-BRETAGNE, France (AP) — There's plenty of poultry to provide sustenance for the longest stage of the Tour de France. From the prized Coucou de Rennes chickens to the grass-fed Sougeal or Couesnon geese, foodies should have no trouble filling their stomachs for the 231-kilometer (143.5-mile) trek from Fougeres, home to the best-preserved and largest medieval fortress in Europe, to Chartres, site of a vast cathedral known for its stained-glass windows. Riding directly east in northwestern France, the stage concludes in an area known as Cosmetic Valley for its cluster of cosmetics and perfume companies. The route skirts just north of Le Mans, home of the 24 Hours of Le Mans auto race. Chartres is just 96 kilometers southwest of Paris, where the Tour will end on July 29. BAGUETTE AND BUTTER: After a couple of hilly days, the race returns to flatter territory with only one category four climb midway through the stage. Expect sprinters like Fernando Gaviria and Peter Sagan to shine again. Greg Van Avermaet should hold on to the yellow jersey. PLAT DU JOUR: Coucou de Rennes chickens, named for their cuckoo plumage, are bred outside Rennes, the capital of Brittany. Recognized for their attractive coat of grey, white and blue-tinted feathers, they're big free-range birds whose meat has a unique texture and nutty taste. For a full platter of poultry, add Couesnon goose from Sougeal, a town near Fougeres. This bird's firm flesh is perfect for roasts, stews and rillettes (spreadable pate). CULTURE: Chartres Cathedral "marks the high point of French Gothic art," according to UNESCO's World Heritage site . VIN DU JOUR: Jasnieres. This aromatic white wine is produced in the Sarthe department midway through the stage. Pairs well with fish and goat cheese. HISTORY: Geo Lefevre, who was born in Chartres in 1887, was a journalist who came up with the idea of the Tour de France. He suggested the idea to Henri Desgrange, editor of the daily newspaper L'Auto, as a way to boost circulation. The first race was in 1903. Bradley Wiggins secured his 2012 Tour title by winning a time trial in the penultimate stage that ended in Chartres. Chris Froome placed second behind his Sky teammate and finished second overall. STAT OF THE DAY: 11 — The increase in speed when Dan Martin accelerated from 19 kph to 30 kph on a 10 percent gradient to win Stage 6 up the Mur-de-Bretagne. QUOTE OF THE DAY: "I saw everyone was on the limit, and there were no teammates left, so why not have a try?" — Martin on his winning attack. DESSERT: Mentchikoffs. These white-colored delicacies from Chartres are filled with a chocolate mixture of almonds and hazelnuts and coated with a meringue. NEXT ORDER: Stage 8 on Saturday is a rolling 181-kilometer leg from Dreux to Amiens, located halfway between Paris and Calais.